We are very happy to invite you to the Flamingo Bar on the best Tuesday of the year; the evening before Labor Day! Since opening last Autumn the Flamingo Bar has quickly become a hotspot for great parties at the centre of the city. 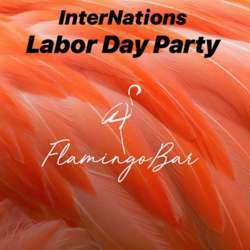 And because it is Labor Day we a pleased that we can offer you this party for free with even a free first drink for all InterNations members. So join us for the best mid-week party of the spring!